Opinary leverages a process as old as time (asking questions) with the theory that people have opinions more often than they have comments. We’ve learned a thing or two about what makes a good question. The definition of good? One that makes the audience (ourselves and you included) want to answer. Questions on politics increase engagement 2.7 percent above the average. Last year, two extraordinary Opinary interns, Rosemarie Foulger and Matthew Baughman, examined 1.2 million opinions shared on 923 Opinary polls. Using a variety of statistical methods, especially Genetic Matching, Rosemarie and Matthew reported causal links between the features of Opinary polls and rates of engagement. Here’s what they learned. Opinary categorized the questions we asked into six types that described the sort of response a person was being asked for. In the chart above, you can see descriptions and examples of the six types: past value, present value, future value, prediction, evaluative, and survey. We found that a future value question, in which a person was asked to assess a moral value in the future, received a 2.8 percent higher engagement rate than any other question. Future value questions also do better than prediction and evaluative questions. Survey questions do better than present value questions. Asking for a past value instead of a future value decreased engagement by 6.1 percent. Opinary separated questions based on topics: politics, celebrities, culture, social media, sports, and innovation (technology). 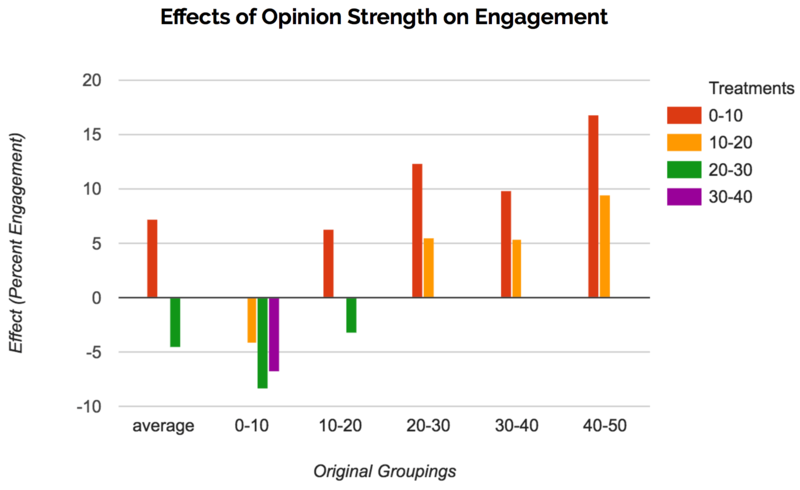 Sports questions had no significant effect on engagement. Above, you see a graph that shows that the stronger someone’s opinion, the more likely they are to share it. The treatment bars indicate what occurs to engagement rates when questions are posed to elicit stronger opinions. So, if you changed a 0-10 strength opinion poll to a 20-30 strength opinion poll, you would lose 8.4 percent engagement. My tenure at Opinary has come to a close and this is the last piece of knowledge from that work that I’ll have the pleasure of sharing with the journalism community. The point has been to create space for more constructive interaction between newsrooms and their audiences. 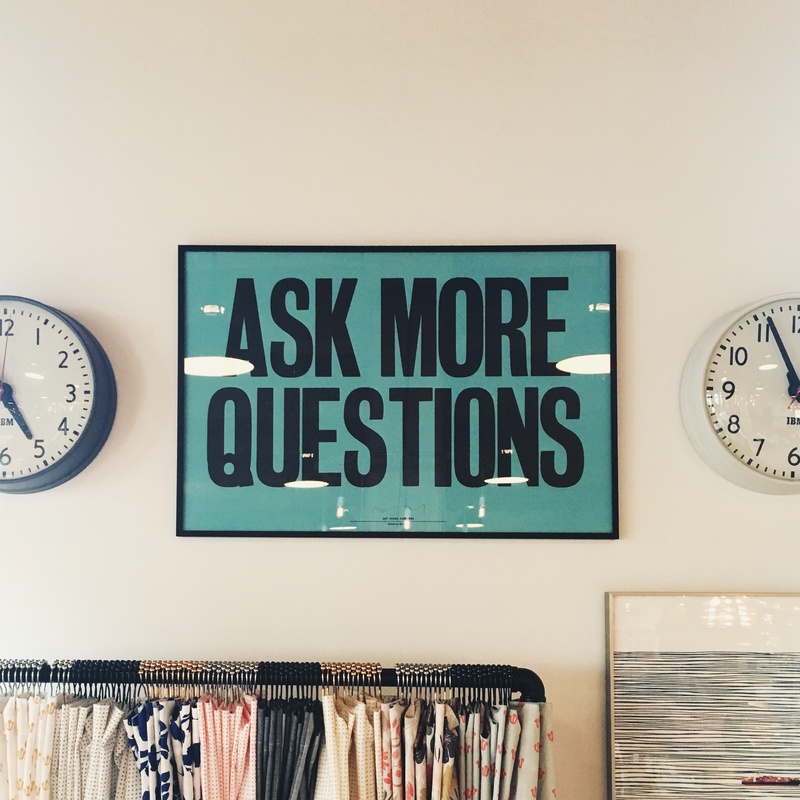 I hope that by sharing this case study on engaging questions, Opinary can continue to help journalists connect more deeply with their audience.